Thank you for taking time to learn more about Fox Club Membership. We have 2 different memberships available for the Fox Club. 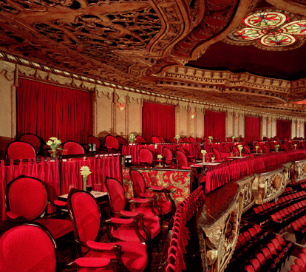 The Fox Club Luxury Box Membership is private luxury seating for a full calendar year, and will include all public performances at the Fox Theatre throughout the year. The Fox Broadway Club Membership is seating in the 1st FIVE ROWS for the seven-show U.S. Bank Broadway Series along with private club-level access and the opportunity to purchase tickets to other events held at the theatre. The Fox Club Luxury Box Membership is undoubtedly the city’s finest corporate entertainment opportunity, with a variety of performances of Broadway shows, family events, comedy acts, dance, concerts and holiday attractions in a calendar year. Click here for our upcoming shows. As a Fox Club Luxury Box Member, you will have full access to your luxury box seats and Fox Club reserved parking for all public performances. This includes up to 16 performances of Broadway show runs, as well as single and multiple performances. Seating is located on the private Fox Club Level, which offers a private club entrance conveniently located on the Fox Club parking lot. Luxury Box Members have access to Concierge Service, the Fox Club Lounge, pre-show dining opportunities, in-box seat food & beverage service and private restrooms. A Fox Club Luxury Box Membership can begin at any time, providing there is a Luxury Box available and is for a three year term agreement. If you have Fox Club tickets for an upcoming performance, please click here for additional information. The Fabulous Fox Broadway Club membership is in conjunction with the 7-show U.S. Bank Broadway Series. Seating for this membership is located on the main Orchestra Level of the theatre in the first 5 rows of the center sections. Along with having access to the private Fox Club level of the theatre, Fabulous Fox Broadway Club Members have fabulous amenities that include priority purchase opportunity for premium seating for Broadway Specials shows, reserved parking, private Fox Club entrance, access to exclusive Fox Club Member only pre-show dining, Fox Club Lounge and Concierge Service. For more information on the Fabulous Fox Broadway Club Membership click here.